Glenville is the name of the rural community situated to the southeast of the city of Baraboo and almost adjacent to it. The boundaries of Glenville are somewhat indefinite, but roughly speaking, it includes Joint School District Number 2, town of Greenfield, which also includes an adjacent strip of land in the township of Baraboo. The civic center of this community, and approximately the geographical center, is the four corners, which were known as the Red School House Corners, and are situated about one half mile south of the bridge at the McArthur dam, or more correctly speaking, it probably would be at the school house which is now located about a quarter of a mile east of the corners. The community was not known as Glenville in the early days, and not until about the year 1890 when the name appeared in connection with some weekly news items contributed by Charles Pearson, and published in the Baraboo News under the heading of News Notes from Glenville. This was probably the origin of the name. The most interesting feature of this locality was its natural beauty. This was mainly due to the luxuriant growth of timber of all native varieties, consisting principally of Elm, Basswood, Oak, and Maple; and, in connection with the River and the Glenville creek, produced a scene of natural beauty that probably was not excelled in all Sauk County, with the exception, of course, of Devils Lake, together with its surrounding pine clad bluffs of quartzite, towering some five hundred feet above. In the spring of 1872, my father moved our family to the small farm that was owned at that time by George Baker, but is now partly occupied by the McArthur families and partly by Henry Barbknecht, so that my personal recollections of the community date from about that time, although I was quite familiar with the locality for some years prior to this. At that time the families living in the immediate neighborhood were those of Benjamine Jeffries, Chauncy Kimble, Agustus Kimble, George Baker, Levi Pearson, Halsey Sutton, William Glover, Freeman Glover, Alexander McGilvra, Arnold Holdridge, I.D. Ganoe, and a few others, isolated and living farther back. The first white settlers who came into this region were no doubt a class known as squatters. They would settle on a piece of land by putting up a temporary dwelling and this would give them first rights as a homesteader. Later on and usually from lack of funds, they would sell their rights, move farther on, and do the same thing over again. Of these people we know very little. However, Mrs. Roseline Peck, the first white woman to settle in the Baraboo Valley, was a squatter. She locater her claim on the lower part of the Baraboo River Rapids, near where the city pumping station is, and the east part of the Third Ward is on her original claim. The county records show that she disposed of her rights, a few years before the land around here was opened to homesteaders. The first permanent settler in Glenville seems to have been Benjamin Jeffries, who was a native of the mountain region of Tennessee. He was born in 1822 and after moving twice to other localities, he came to the Baraboo Valley in 1845. He was the perfect type of a pioneer and had all the qualifications of a backwoodsman. Being very efficient in the use of a rifle, and also with an axe, made him right at home in the wilderness. He also was very entertaining and would relate many events and anecdotes of his earlier life in a very interesting manner. One incident which he used to relate demonstrated the wonderful physical ability of the man. A neighbor being taken critically ill, it became necessary to obtain some article from a drug store. The nearest stock of drugs was at Sauk City some eighteen miles distant; and as there was no wagon road over the Bluffs at that time, it became necessary for someone to make the trip on foot so Mr. Jeffries volunteered to go. There was however, a trail which led over the Bluffs and this followed very closely the present course of the east Sauk road which passes near the south end of Devils Lake and this was the route that he took. As time was the all important factor in the situation, he ran almost the entire distance both ways; or as he expressed it, “he went on a dog trot”. Leaving here about three o’clock in the afternoon, he arrived back here at about nine o’clock in the evening, making the round trip of some thirty-six miles, besides climbing the Bluff twice which is probably some four hundred feet high. I have always considered this to be quite a remarkable record of speed and endurance. In 1848, the same year that Wisconsin was admitted into the Union, the public land around here was opened to homestead entry. Mr. Jeffries had selected as his claim, the southwest quarter of section six, town of Greenfield and he established his home at the northeast corner at what now is the four corners at Glenville, where he resided for the remainder of his life. He raised a family of three daughters and three sons. The daughters, Mrs. Jessie Taylor, Mrs. Mina Whitlock, and Mrs. Florence Pearson, still survive him. There are also several grandchildren, among who are Homer and Lee Jeffries of Baraboo, who seem to have inherited many of the traits of their grandfather. Mr. Jeffries was an ideal neighbor and citizen and the members of the Glenville community were fortunate and benefited much by his having lived among them. Strange to say, this small stream never had any official name, so the best that we can do is to call it Glenville Creek. Its source is in what was known as Brewster’s Marsh, which is located well up on the bluff, on the farm which is now occupied by the family of Reinhart Shultz. It flows westward for about a mile to the vicinity of the German Lutheran Church, where it turns to the northwest and cutting through the first ridge of the bluff, it flows on down entering the river just above the McArthur dam, completing a very interesting course of about four miles. It originally joined the river some ten rods below the dam, its course having been changed up near the foot of the bluff many years ago. The old channel still may be easily traced. It is with much regret that we note the continual shrinkage in the volume of water, for at times in later years, it almost ceases to flow, and judging from the feeble trickle in midsummer, nobody would ever imagine that the little stream had ever aspired to turn the wheels of industry. However, it was able to do so, with considerable efficiency. The first attempt was made away back about 1844 by Thomas Clark, who established a small grist or feed mill right across the highway from the present home of James Fisher, just a short distance south of the Glenville corners. The water to operate this mill was diverted from the creek some distance farther south on what is now Willis Glover’s place. A small dam was made and a raceway was dug which ran on the west side and parallel to the present highway to a point opposite the mill and was the conducted across the wagon road in a covered wooden flume and discharged onto an overshot water wheel. This wheel, as I remember it, was an immense affair, some twenty or maybe twenty-five feet in diameter and provided with a large number of buckets on its circumference. As these buckets would pass the top center, they would fill with water from the flume and gravity would accomplish the rest, causing the wheel to revolve. As the buckets neared the bottom, they would empty, and continue on to the top, to be again filled with water. The operation of this grist mill was the cause of changing the course of the creek. Because after the water had passed the wheel, it had dropped too low to get back to the creek so it took the course of least resistance, and cut a new channel to the river. In later years, Mr. Jeffries turned the whole creek into the new channel, by obstructing the old one and digging a new one for a short distance. I have reason to believe that this little mill was the first one in the Baraboo Valley where grinding was done and settlers came for many miles around with ox carts and a small load of grist and this of course took a whole day. Later on there was some wool carding machinery put in and they carded the home grown wool for the settlers, many of whom still used spinning wheels in their homes. Still later on, a brother of Levi Pearson, put in some wood working machinery and they made doors, window sash and blinds in small quantities and various other articles. But in a few years this all came to a sudden end by the sudden death of Mr. Pearson. He was turning some wooden article in a lathe, when the piece flew out of the lathe centers at high velocity and struck him in the abdomen, from which injury he died in short time. A few years later, the building was demolished and nothing now remains but parts of the old race-way which may still be traced along the west side of the highway. Another enterprise was a saw mill which was located about half way up the bluff on the farm now occupied by the family of Julius Gregol. This was built and operated by Abraham Lazeart, a French Canadian from the province of Ontario, along in the later sixties, and he was assisted by his two robust stepsons, Daniel and Dwight Wheeler. The dam was located advantageously in a deep and narrow ravine so that quite a high dam was easily and cheaply constructed, thus obtaining a strong fall with a small volume of water. The water was conducted form the top of the dam in an elevated wooden flume to the mill which was located a few rods down the stream. The mill was equipped with an immense up and down saw and many logs were sawed into lumber for the farmers for many miles around. Most of the lumber was of hardwood, but many basswood and poplar logs were made into house siding. This mill was continuously operated for many years, but at times when the flow of water was scant it could be used only part of the day. The operation of this mill in the winter caused an immense ice formation in the creek bed, which at times assumed the dimensions of a small glacier. The cause of this was that when the water was turned on to operate the mill, the passage under the ice was not large enough to accommodate the increased flow and it overflowed the ice and came down stream on top of it. Some of this froze and every day added a new layer of ice until finally the banks were filled and it then overflowed onto the surrounding flat ground. The ice usually attained a thickness of from twelve to fifteen feet and it was always late in the spring before the ice disappeared. Another water power, although somewhat smaller, was developed still farther up the creek by Mason Prothers. This was located a short distance east of the German Lutheran Church on the farm now owned by William Schubring. The most important equipment of this small mill was a saw and a wood turning lathe and the principal use of these was in connection with a blacksmith shop which was operated by Louis Prothero, father of our ex-mayor, R.W. Prothero. He made a specialty of the repairs on wagons and buggies and even built a few new ones with the exception of the wheels which were obtained elsewhere. Mr. Prothero had the reputation of being a very industrious and skillful workman and many of the surrounding neighbors were loud in their praise of the work he had done for them. The most important industry of early Glenville, with the exception of agriculture, was the production of lime. These operations were confined to a narrow strip of land along the creek bottom, extending from about the foot of the Bluff, to about a mile or so up stream. The cause of the deposit of limestone was that the creek in making the loose soil away, leaving the stones strewn all over the creek bottom. These stones varied in size from a pebble to boulders weighing a hundred pounds or even more and all that was necessary to obtain them was to take a wheelbarrow and pick them up and wheel them to the nearby kiln. Later on as the supply on the surface became exhausted, it was necessary to use a pick and shovel and do some shallow digging. The first man to experiment and develop the possibilities of this industry was Lyman Messinger along about the year 1870. He constructed a small experimental kiln on the Halsey Sutton place, which is now owned by Julius Lucht, and burned a small amount of lime. This proved to be of very excellent quality, in fact much better than from stone which was quarried from solid ledges. I never knew just why Mr. Messenger should have been interested in developing this industry as he never appeared to be connected with it afterward. However, on the strength of this experiment, Mr. Sutton then built the first kiln for commercial purposes and soon after, George Glover became associated with him and later on took over the entire operation of it. The capacity of this kiln was not sufficient to supply the demand for lime at that time so Louis David established another kiln farther up stream and Alex Crawford built a third one still farther up. These kilns were constructed in two parts, one on top of the other and connected by a passage. The lower part was an arched fireplace, provided with grates, and large enough to take in four or five sticks of cordwood at one time. On top of this was built a large cylindrical cup shaped container with a capacity of several wagon loads of stone. When all was ready, the fire was started and the heat passing up through the mass of stones soon got them to a red heat. It was necessary to maintain them at this temperature continually for three days and nights, at the end of which time the process was completed, and as soon as cool enough to handle, the lime was ready for the market. These three kilns continued to operate during the building seasons for many years, and this lime was used in the construction of most all the business buildings and many of the dwellings of Baraboo. These kilns consumed large quantities of fuel, and thus provided a convenient market for hundreds of cords of wood, adding considerable more to the benefit of the community. One little incident that occurred may be of interest, as it demonstrated the great amount of heat that is generated by slacking lime. Mr. David had started for town with a load of lime when he was overtaken by a sudden hard shower. Of course the lime began to slack and the resulting heat was so great that it soon set the wagon box afire and destroyed it and it was with much difficulty that Mr. David saved the rest of his wagon. From various causes, all of this lime production gradually came to an end. Probably the main factor affecting this was the increasing use of cement for building purposes. Another cause was the decreasing supply of fuel, together with a corresponding increasing cost of it. Also the supply of limestone was not so readily obtained, they had to go farther and also do more digging for it, and about this time the price of labor began to rise. So it finally got to the stage when the margin of profit was too narrow and in 1902, Mr. Glover burned the last kiln of lime on the creek. This was used in the construction of the new Catholic Church, and when Mr. Glover settled up with Father Durward, he cancelled the final twenty dollars of the account. This was very generous of Mr. Glover, for it meant considerable sacrifice for him and the act served well to illustrate the character of the man. Thus ended the lime business on Glenville Creek, probably for all time. Another enterprise which at one time promised to eclipse everything else in Glenville was a sandstone quarry. This was established by Mr. I.D. Ganoe on his farm which was located about a mile and a half east of the Glenville corners and near the eastern end of the first ridge of the Bluff. The stone from this quarry was of a very desirable buff color and the formation occurred in layers, which worked readily into blocks of almost any dimensions. These were used in the top courses of the foundations for buildings and also for doorsteps and windowsills and for these purposes were much more desirable than the stone from other local quarries. But the larger part of this stone was used by the Railroad Company, in huge blocks, each weighing a ton or more, one block making a load for a team of horses. They were used in bridge piers, and abutments and many of blocks may be seen in the abutments of the railroad viaduct where Hill Street passes under the tracks, going to the city pumping station and also on the south side of the railway embankment where South Boulevard passes under the tracts. The quarry was equipped with a large crane, capable of handling several tons, and it also was provided with a blacksmith’s forge, where the tools could be dressed and tempered. The work of getting out the stone was supervised and done by Nelson Bartley and James Stott, who were usually assisted by two or three other men. It was a long distance and a hard pull to haul these large blocks to the railroad with horse power and wagons so Mr. Ganoe conceived the idea of a branch rail track. This was to connect with the main line somewhere about halfway between Baraboo and the Lake, and follow along down at the foot of the Bluff to the quarry. He also visioned the future extension of the branch down the Baraboo Valley to Portage and connect with the Milwaukee Road. He was successful to the extent of persuading the railroad officials to make a survey of the route and an estimate of the cost, but this was as far as the branch ever materialized. The construction was delayed indefinitely and in the meantime, Mr. Ganoe got into a controversy with the Company about some stone contract and this led to a lawsuit in which he lot out. It is probably needless to add that the branch line bubble burst right there and the main part of the quarry business came to an end. There probably has been no stone taken out of there for the past fifty years and in passing by, one would hardly notice now that there ever had been. Doubtless there is still enough stone left in that old quarry to duplicate the Great Pyramid of Egypt, and by the way, this might not be such a bad idea either. It surely would solve the vexing problem of relief work for a number of years to come and when completed, might be made into some kind of an attraction for tourists. We have seen a number of less practical projects than this materializes. Mr. I.D. Ganoe was probably the most outstanding character that Glenville has ever had. He was another French Canadian, but not of the pioneer type as most of them were; but rather he was inclined to the ways of civilization. He was somewhat more refined and apparently he was somewhat better educated than the average of his neighbors, and still he seemed to crave much more than what he possessed. He often visited the school and never failed to give an interesting talk, often praising the work of the teacher and urging the pupils to grasp all the knowledge they possibly could in the limited time that they were allotted at rural schools in those days. Mr. Ganoe’s farm was on what is called the River Road and is now occupied by Mr. Hardy. He never seemed to take a very active part in the farm operations but as he had raised three very interesting families and the majority of them were boys, he never seemed to lack for plenty of help on the farm. However, he was very active in various other matters, but his principal interest in life seemed to be spiritualism and evidently he was sincere in his belief. We have reason to believe that he was the pioneer promoter and helped to organize the first society of that religious belief in the Baraboo Valley. For many years they held regular meeting, or séances as they were called, at his home during the winter, and occasionally during the summer; and the members attended from many miles around. Occasionally at these séances, Mr. Ganoe would put on something extra with some few friends from Chicago who acted as mediums. It must be admitted that on these occasions some of the demonstrations were quite spectacular and even startling; but most of the members appeared sincere and a few shook theirs heads skeptically, but said nothing. However it is not our intention to discuss the merits or otherwise of this belief, for every one should be free to believe as he sees fit; but regardless of whether the demonstrations were real or otherwise, the fact remains that Mr. Ganoe accomplished much real good for the community in a social way by bring the neighbors together on these occasions, for in a large measure it relieved the monotony of the long winters which for various reasons seemed much more tedious in those days than they now are. A very few of the initial members of the society still survive and the organization is still active, maintaining quite an elaborate summer camp at Wonewoc, where the meetings are well attended. The raising of a new bridge over the Baraboo River in the days gone by was an event of considerable importance in the neighborhood. For many years the town of Green field has maintained three bridges over the river and in those times they constructed entirely of wood, and being exposed to the action of the elements, decay soon started, and their life was short. Usually about seven or eight years was the age limit, so that it was necessary to build a new bridge somewhere in the town at intervals of about every two or three years. Most of this construction was planned and done by Mr. Orson Simonds, Father of Cyrus Simonds of Baraboo. Mr. Simonds was a many of very few words, but he evidently could do much thinking, for his work always fitted together without any hitch or delay. The timbers were all hauled to the bank of the river and were there fitted and marked so as to be readily assembled. When all was ready, a day was designated for the raising and word was passed around from farm to farm so that all who so desired could be there as there was always plenty of help. The work was not very strenuous and was considered by all as just a holiday. This was usually accompanied by a picnic dinner or supper as circumstances might be and sometimes a keg of beer mysteriously appeared, but nobody seemed to be responsible for it. It just happened to be there. The last wooden bridge, at the McArthur dam, was put up in the late seventies by Mr. S.F. Amy, and assisted by William Loy and Eli Jones, all of Baraboo. Of course everybody was looking forward to a bridge raising but these three men with the use of a tackle block and a few long ropes accomplished the raising of the bridge with little or not excitement, very much to the disappointment of all the boys of the neighborhood for this seemed to mark the passing of the “good old days” of main force and man power. The next bridge at this location was the present iron one which was put up in 1888 and will soon be fifty years old. It still is apparently in good condition and would serve the purpose for many years, but being limited to one way traffic and being on a State Highway, it will probably be replaced with a wider bridge in a very few years. In later years, after all the earlier industries had passed into history, George McArthur and son joined the community and established a towel mill near the river bridge. They came to Baraboo from Appleton, Wisconsin and for some time operated a small plant near the Island Woolen Mill. In 1898, after considerable negotiating, they secured the flowage rights between the Baker Bridge and the City Pumping Station and they also purchased part of the farm which my mother still owned. They built a dam a few rods above the bridge which produced a fall of some eight or nine feet and also constructed a towel mill on the north side of the river. The farmers of the neighborhood cooperated to a considerable extent in all this work. They hauled many tons of huge boulders from the Bluff to help anchor the dam and aided in various other ways. For many years they continued to manufacture towels and rugs and also for a few seasons they undertook to work flax fiber into tow, but the farmers broke down on their part of the program when they discovered that their land was too badly infested with weeds to raise flax so the making of tow was abandoned. All this work finally came to an end, through the mill being destroyed by fire. In the meantime, however, they had acquired the power rights on the rapids in Baraboo and had constructed a mill on Water Street, so that towel and rug business was carried on with very little interruption. 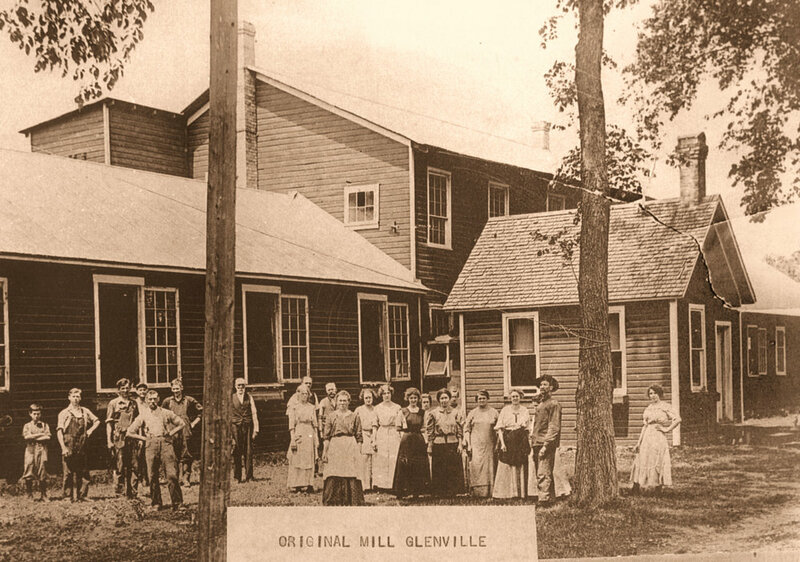 At the present time the power at the Glenville plant is used exclusively for generating electric current, furnishing light and power to a large number of rural customers and also to the cottages at Devils Lake. For the last few years the business has been carried on very successfully by the three grandsons, George III, Andrew, and Robert, the latter being manager of the electric light and power department. In various ways, the McArthur families have been of much aid to the community. They not only furnished employment for many of the neighbors and also provided comfortable homes near by for a number of families but they were an important factor in promoting the social and religious development of the community. It may be of interest to add a few notes concerning a race of people known to us as the Mound Builders. Of these people we know but very little; however, we have plenty of evidence to show that this locality was inhabited by them at some pre-historic period and that the vicinity of Glenville was a favorite dwelling place for them. The evidence that these people left of their existence was principally the earthen mounds which they constructed; some of the conical, while others were lineal. The conical mounds were usually some twelve to fifteen feet in diameter at the base, and lineal ones were about two or three feet in height and often in the crude form of some animal. Just what their object was in building these mounds is largely a guess; but in view of the fact that human remains have been found in many of the conical ones, they may have been intended as burial places for a few of the more prominent members of the community. It is also possible that all of the mounds were a part of some form of religious worship. Some of these mounds have been destroyed and many others have been defaced. Parts of two or three conical mounds may still be seen on the north bank of the river, a few rods east of the bridge and a fine specimen of a lineal mound may be found which follows the crest of a high ridge about one third of a mile west of the bridge and south of the river. Many flint arrow heads have been found in the vicinity of this mound. The spot where arrow heads have been found most abundant was on the McGilvra farm east of the four corners; and many fine specimens have been picked up on the flat field between the highway and the river. We used to picture this out as a possible ancient battleground, but more likely it was a spot that was advantageously located for rounding up wild animals in a wholesale kill. There was also evidence of an ancient arrow maker’s plant in Glenville and this was located on the top of a sand knoll about midway between Mrs. Macarthur’s home and the river. My attention was first called to this spot by Chester Messenger and it was his opinion that many of the arrow heads found around here were made at this place. The ground for several feet around was thickly strewn with fragments of broken flint and we picked up many defective heads that evidently had been broken in the process of shaping and had been cast aside. Thus we may trace the various industries of Glenville from the primitive making of arrow heads by the pre-historic men to the manufacture of towels and rugs with modern machinery; and all that remains of them today is the good old standby, agriculture, the generating and distribution of electric current, and Mr. Steinke’s grocery store and filling station. It is now some sixty-five years since I first joined the community and many changes have taken place there in those years. Many of these changes are probably for the better, but some of them maybe are not. Nearly all of the natural beauty has been destroyed, mainly through the clearing of the land for agricultural purposes and also by the construction and widening of the modern highways. The shrinkage in the volume of flow of the streams has also contributed much to the loss of beauty. We no longer can see the flocks of wild mallard ducks flying up and down the river; nor can we hear at sunrise on a spring morning, the calling of the prairie chickens in their deep bass tones from the neighboring meadows. They are gone and this also includes nearly all of the wild life. The modern high-powered shotguns, combined with “eternal vigilance” have all but annihilated them, without even the privilege of a fighting chance. Of the people who were living in Glenville in 1872, not one of them that I know of is residing there at the present time. The older generation at that time, have probably all passed to the Beyond. Of the younger generation, many still survive, but they are scattered far and wide and I have lost track of most of them. Beside the few that I have already mentioned, I have reason to believe that Sherman Pearson, Frank Kimble, and Hattie Kimble are living in California, Frank Baker and Kittie Baker are at Ft. Morgan, Colorado, and Lillian McGilvra lives in Massachusetts. A very few have not wandered far and are living here or in this vicinity. They include Emma Sutton, three members of the David family, Mrs. Thompson and two brothers, my sister Elizabeth Slye and myself, also Alma Briggs of Elroy. There are doubtless a number of others who still survive, whom we would be very glad to hear of. These people, with very few exceptions, were industrious, honest, good hearted and economical, which are traits that are commendable and contribute much to the making of good citizens. It has been much pleasure to me to recall these few commonplace events and we hope they may be of some interest to the present generation as well as to the generations to come; and as I look back over those years and recall the people connected with those events, I feel that I was fortunate in having had an opportunity to have lived among them.